It is copyright © Alan Loney and Jacket magazine 2009. See our [»»] Copyright notice. Alan Loney’s first book of poems was published in 1971 and he began printing in 1974. 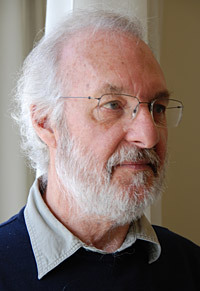 He was co-winner of the poetry prize in the New Zealand Book Awards in 1977, Literary Fellow at the University of Auckland in 1992, and Honorary Fellow of the Australian Centre at the University of Melbourne 2002-2006, and Convener of the Conference on the History of the Book in New Zealand at University of Auckland 1995. Loney has published 11 books of poetry, and eight books of prose with a recent emphasis on the nature of the book. Recent books of poems are: Fragmenta nova (Five Islands Press, Melbourne 2005), Nowhere to go, and other poems (Five Islands Press, Melbourne 2007), and Day’s eye (Rubicon Press, Canada 2008). Recent books on printing are: The printing of a masterpiece (Black Pepper, Melbourne 2008), and Each new book (The Codex Foundation, Berkeley, Calif. 2008). His latest limited edition book is Fishwork, with drawings by Max Gimblett and a Foreword by John Yau (The Holloway Press, University of Auckland 2009).